The Sub Regional Disability Strategy 2017-2022, covering the Wairarapa, Hutt Valley and Capital and Coast District Health Board regions, has been officially launched. Hutt Valley DHB Chief Executive Ashley Bloomfield said the strategy builds on the significant work already achieved since 2013 to improve health service responsiveness for people with disabilities. He spoke at the launch on behalf of the CEs of the three DHBs to mark their endorsement of the strategy. Disability Rights Commissioner Paul Gibson and Health and Disability Commissioner Rose Wall spoke at the event about the significance of the strategy to the disability community both nationally and internationally. Paul Gibson congratulated all those involved for creating a roadmap for the future of disability health services in the region. According to the 2013 census, one in four New Zealanders have a disability. Disability can include physical, mental health (long term and enduring) intellectual, sensory and other impairments including long term health conditions. Disability is created by various barriers that hinder the full and effective participation of people in society on an equal basis with others. 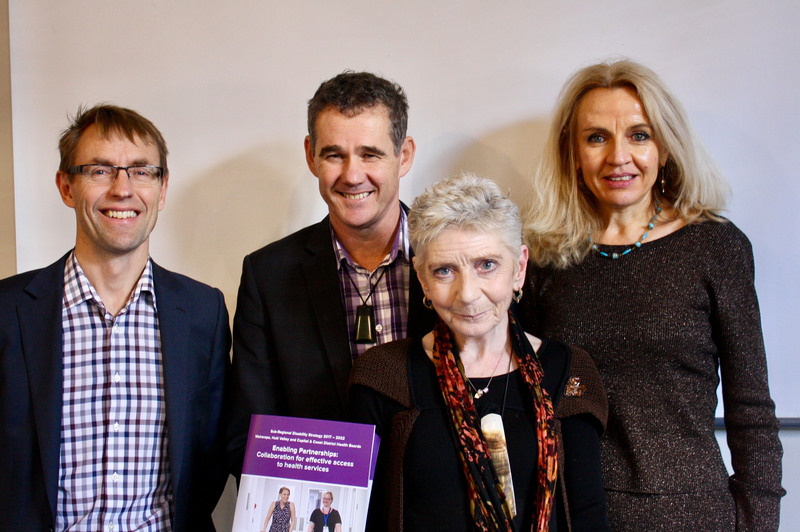 Image: From left, Ashley Bloomfield, Paul Gibson, Pauline Boyles and Rose Wall.